A couple weekends ago, we had a big family gathering. When that happens, a fabulous breakfast is always a must. I LOVE big breakfasts on the weekend, especially when there are lots of people to enjoy it. One of my favorite breakfasts are the overnight casseroles. They are SO easy to make and all you do is throw them in the oven in the morning. No prep work in the morning? Totally my way of doing things! This recipe was given to me by my cute sister-in-law Autumn and is now one of my absolute FAVORITES! It is heaven in your mouth… seriously! 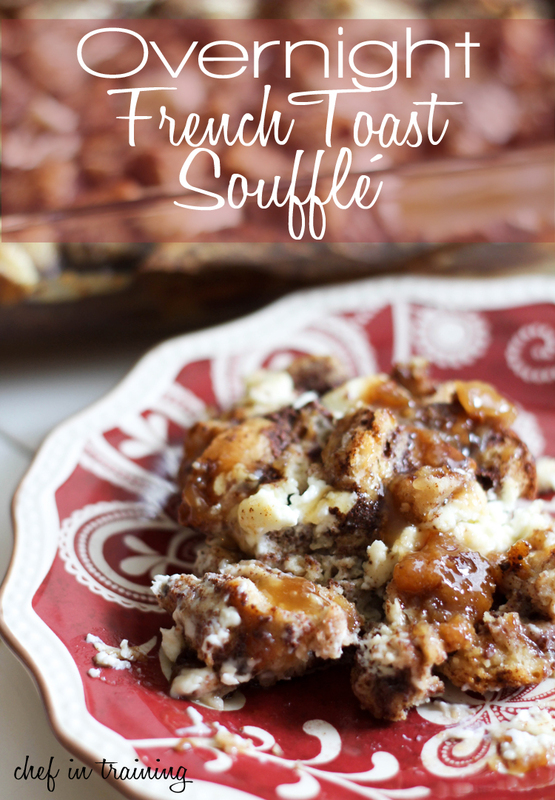 This breakfast is SO easy and literally heaven in your mouth! 1 loaf Cinnamon Bread, I used Cinnabon brand, but you can use any cinnamon loaf. Great Harvest is great! Melt butter, brown sugar and corn syrup in sauce pan over medium heat until sugar is melted. Pour in the bottom of a 9x13 pan. Cut bread into 1 inch squares. Cut cream cheese into small squares. Layer half of bread squares over brown sugar mixture in the 9x13. Next sprinkle a layer of cream cheese squares. Top with remaining bread squares. Whisk eggs, cream and cinnamon in a bowl until beaten thoroughly. Pour over bread making sure to cover all the bread. Press bread down if necessary. Cook uncovered at 350 degrees F for 35-45 minutes or until brown and set. Sprinkle with a little powdered sugar if desired. Oh. My. Goodness. This looks insanely incredible! I'm a huge French toast fanatic, and anything that can cut back on prep work but still look this awesome and tasty is an A+ for me! Nikki this looks crazy good! Cinnamon bread is one of my faves (and so are brown sugar and cream cheese!) And love the make-ahead ability with it, too! Wow! How perfect would this be for those overnight guests, or for a brunch time shower?! Definitely saving this recipe, I know it'll be a hit! I love breakfast casseroles that can be made the night before. Anything that saves time in the morning is a plus for me. Also one that looks so delicious is always perfect too! Love that this has cream cheese in it!!! Oh my gosh your overnight french toast sounds amazing!!!!! I wish I made some for breakfast today! This is dangerous, I love it! Any suggestions for making this recipe without cream cheese??? Do you think a flavored yogurt could work? My famous caramel french toast is this recipe minus the cream cheese, so yes, it will still be spectacular. I also sub coconut or almond milk instead of cream. Love overnight french toast. Make it every time I have overnight guests. which is often. My only suggestion, based on my daughters preference, would be to make sure that the cream cheese is truly cut into small pieces or do what I now do is I cream it the mix master and then spread that. I also add or mix together a layer of jam, each time a new flavor, and now since she just got married and we made blueberry jam as the favors, that will be the next jam added. hi! I just started reading your blog. I wanted to ask- do you ever consider lightening up the recipes at all? Using low fat vs full fat or subbing things like cream cheese for nuestenfal cheese? If you've tried it, how have they come out? Can this be frozen? I have 16 people for a week at Christmas and anything I can make ahead I cherish!! Is there a way to make this lower in calories? Do you have to use heavy cream? I made this for Christmas brunch. I used cinnamon raisin bread, added pecans and only 1 tbsp cinnamon! It's definitely a keeper recipe! I made this dish this morning for my family of 6. I admit, I had high expectations. The pictures make it look delicious. However I feel that it lacked something. Don't get me wrong, it was tasty, but not "amazing". I honestly believe it needed butter on top of the breading and that would have made a big difference. Also, it was sweet, but not as sweet as I was hoping for. In addition with the butter, if I was to ever make it again, I'd perhaps add some type of maple syrup mixture to the top as well. Thanks for the recipe. I'm always up for trying new things and this was definitely a first. I've used a couple of recipes in your blog. This Christmas I tried the Overnight French Toast soufflé . And, it was magnificent. You have a real future! Thank you for sharing. On the show this morning you mentioned you had a giveaway. Who do we enter to win that? I plan to make the french toast tonight for tomorrows breakfast. I meant how not who.